This term developed into a negatively understood synonym for the American vines or direct carrier wines par excellence, which is not correct, because American vine is not necessarily "direct carrier" (ie ungrafted ) means. in the südburgenland The wines from various American vines were called Uhudler, so it is a collective term. Some cause the strawberry flavor or penetrants Foxton; an unpleasant taste for European terms. It should be noted, however, that while "foxtone" and "strawberry flavor" are mostly common, they have different but not the same substances causing the mists. These sounds were the main reason for the refusal. One of the decisive opponents of these wines from American vines was Fritz Zweigelt (1888-1964). In 1929, a mandatory labeling was introduced in 1936 issued a ban on planting and 1937, a cut-off ban introduced. After the war, the 1937 deadline for grubbing-up of 75% of direct-vineyard areas expired. In 1961 there was a traffic ban (serving and selling) for the Uhudler, he was only allowed for personal use as house trunk to be produced. And finally in 1985 the Uhudler was declared a "non-wine". All this contributed to the (unjustified) bad reputation. Because that he due to supposedly high salary methanol (Wooden spirit) and fusel oils "Stupid and blind" and make a "Rabiat pearl" is long since scientifically refuted. A high methanol content is due to improper pressing and has no relation to American vines or unprocessed vines (direct carriers). Actually, the Uhudlerwein is an organic product par excellence, because the resistance of the varieties against fungal diseases (and phylloxera) almost no spraying or fertilizing is required. From 1992, a "decriminalization" took place. The Uhudler is allowed today to a limited extent in eight communities in the wine-growing region südburgenland produced and also marketed. In a wine cellar in the municipality of Heiligenbrunn is the "Uhudler-Vinothek", where you can taste and buy wines from the various grape varieties. Upon accession to the EU, Austria applied for classification for the seven varieties used for the Uhudler. Those were Concord (or. Ripatella, which at that time was still regarded as a separate strain), Delaware. Elvira. Isabella. Noah and Othello, It is American hybrids, which are largely rootless (grown as a direct carrier). Of these, the three varieties Isabella, Noah and Othello were banned by the EU for the production of wine in principle. 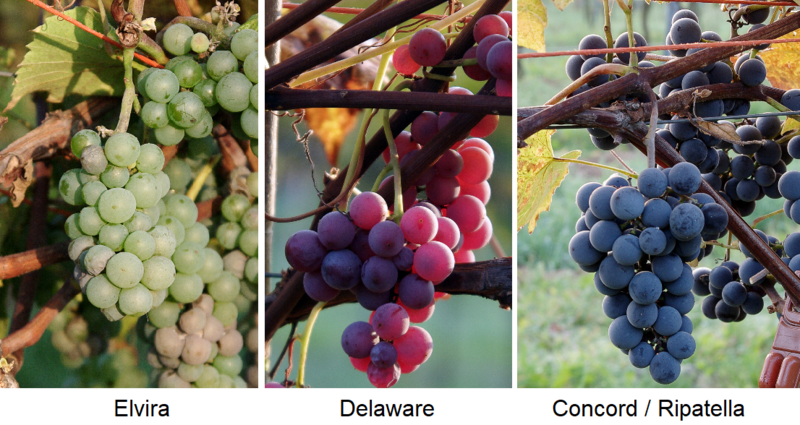 The other three varieties are crosses with proportions of Vitis vinifera genes. Accordingly, they are authorized under EU Regulation for wine (see also under Quality wine-grape varieties ). Nevertheless, there was great excitement in 2016, because there was a 2030 temporary cultivation permit for certain varieties. There were considerations, the Uhudler as fruit wine market. The now nine approved varieties are Concord (Ripatella), Delaware and Elvira (as before), as well as the six newly added Amadeus. Bogni 15. bolero. Boris. Breidecker and Evita, They all contain genes from Viti vinifera, so they comply with EU regulations. For the nine varieties, there are no more limited planting permission. According to the criteria set by the Federal Province of Burgenland, the Uhudler may, as before, only as wine (formerly table wine ) are marketed. There are at least two versions of the origins of the original name: in the past, vintners often spent up to a week in the wine cellar during the grape harvest and subsequent work. When they came home after an exhausting period of intense wine drinking with "rings under their eyes", their wives reacted by saying, "You look like an eagle owl. In a second version, the name is on the Plutzer returned, a used for the Uhudler and locally referred to as "Udler" clay pot. In Styria, a wine from these varieties is also produced, the name Uhudler may only in the südburgenland be used. That is why he is sometimes referred to as "Juhudler", "S'Uhudler" and "Suhudler" in the province of Styria or "Isabella" after the commonly used variety. This page was last modified at 19 February 2019 at 07:45.